U.S. EPA's new chief of staff doesn't scare easily. Gwen Keyes Fleming is a former district attorney who's gone nose to nose in the courtroom with accused murderers, drug dealers, corrupt officials and other bad guys. "Being up against an opponent in a courtroom and being on for the length of a trial, you do build a certain stamina," Keyes Fleming said. "You just get in the ring and do your best job to prove your case." Now Keyes Fleming is taking on all comers for EPA. "We've got a good story to tell," she said. "So I'm ready for this." Former prosecutor Gwen Keyes Fleming (right) doesn't fear critics of U.S. EPA. Photo courtesy of EPA. Her bring-it-on style seems a good fit with her boss, Administrator Gina McCarthy, who relishes spirited showdowns on policy (Greenwire, Nov. 13, 2009). EPA -- a favorite target for Republicans -- is no place for a glass jaw. Keyes Fleming, 45, arrived at EPA headquarters this spring after more than two years as head of the agency's Atlanta-based Region 4 office. She spent almost six years as the top prosecutor in metro Atlanta's DeKalb County, where in addition to work on violent crime cases, she helped indict a former school superintendent on racketeering and theft charges and probe a series of deadly shootings by police officers. Hers is an unusual resume at EPA, but she says her prosecutorial chops have come in handy during her first six months at an agency that is under siege from Republicans in Congress and industry critics. "I think for me and for the administrator, it's energizing," Keyes Fleming said of EPA criticism. "Both of us come to this with the right heart and desire to do what's right for people, and when people try to say that that is wrong, we fight back. ... It just emboldens us to work harder." As she spoke, both McCarthy and EPA's top air official were being grilled by House Republicans at hearings on Capitol Hill. Being EPA's chief of staff is a demanding, sometimes frantic job. Keyes Fleming's office is attached to McCarthy's on the third floor of the William Jefferson Clinton building in downtown Washington. She usually meets with the administrator several times a day, and they call each other when McCarthy is on the road. Michael VandenBergh, who served as the top aide to former EPA Administrator Carol Browner, said the job is "like being an air traffic controller for management, regulatory and budget issues." Said Peter Robertson, who was also chief of staff to Browner, the job is "keeping the trains running on time" as well as the "care and feeding of the administrator, making sure that things are running right." Keyes Fleming is also likely to spend time interacting with White House staff, he added, as EPA tries to move its initiatives through the White House review process. And the post requires handling problems that arise when you least expect them. "There's always, every single day, a certain amount of crisis management that you have to do," Robertson said. "It is inevitable that something you didn't expect to work on that day pops up and needs your attention." And it helps to mesh with the agency's boss. "I do think they have nice styles that complement each other, and my sense is that Gwen has a really good understanding already of the way that Gina operates and wants to continue operating as administrator," Robertson said. Keyes Fleming and her husband, Randal Fleming, packed up their two boys -- ages 5 and 7 -- and drove to Washington, D.C., on Memorial Day weekend. She arrived on the job before her boss had even officially gotten the job; McCarthy was nominated in March, but her confirmation was stalled until July. "Once Administrator McCarthy was nominated and she started thinking about her team, Bob [Perciasepe] actually mentioned it to me," Keyes Fleming said. Perciasepe, the agency's No. 2, was acting chief at that time. "It was like, 'Wow, I get to come to D.C.?'" Keyes Fleming said of the offer. The New Jersey native had lived in the Atlanta area since graduating from the Emory University School of Law in the early 1990s. Former Administrator Lisa Jackson's chief of staff for four years, Diane Thompson, left her post in May. McCarthy and Keyes Fleming worked together on air issues while she was at Region 4, Keyes Fleming said, because the Atlanta office was the lead region on air at that time, she said. "There was lots of opportunity for contact. And somebody, I guess, put in a good word, and thankfully, I'm glad they did." She told McCarthy that she wanted to operate as the agency's "drawstring," coordinating EPA's work with the White House and Congress and making sure all stakeholders were represented in EPA decisions. Part of her job is keeping Perciasepe in the loop, as he serves as EPA's chief operating officer. "So I pull all of that in together to make sure they both have what they need," she said. The hours add up, but Keyes Fleming makes it work, even with two young kids at home. Sometimes, that means she's sending emails at 11 p.m. or midnight. "If I can't sleep, it might be 2 [a.m.]," she said. "I've apologized to the team and said, 'I hope you understand that basically when I leave here, I go home to take care of the family, and then I go back to work.'" Keyes Fleming said the hours are part of the game in Washington. "The pace is very different," she said. "There's a certain electricity that's here. And some days, it's great, very energizing, and some days it's kind of like that spark that you just wonder about." Atlanta, on the other hand, "was just very easygoing." Even her kids are moving at a fast pace. They're pushing their parents to get a dog, a move their parents have delayed -- at least until they get permanent housing. "That's the big debate in the house," Keyes Fleming said. She has settled into her office after months on the job, and photos of her sons in their sports uniforms are on display. She also has a photo of herself with former President Clinton, taken in July, when they renamed EPA headquarters for him. She feels "somewhat guilty" because her picture of herself with President Obama is still in storage. But the photo of her with Obama is proudly on display at her mother's house, she noted. Her mother, Ursula Keyes, is a retired registered nurse originally from Bermuda. Keyes Fleming and her family head to the islands annually to vacation and catch up with relatives. Her late father, Andrew Keyes, was a former member of the Tuskegee Airmen and a mechanical engineer for the U.S. government, according to his 2007 obituary in The Atlanta Journal-Constitution. Keyes Fleming is one of four children, with two brothers and a sister. Despite her workload, Keyes Fleming still finds time to eat at her favorite local restaurant -- Ford's Fish Shack in Ashburn, Va. -- catch an occasional football game and devour crime thrillers. Everyone in her family has an Atlanta Falcons jersey, but it's been an adjustment since they came to Washington and have trouble finding the games on television. They're becoming Washington Redskins fans, "just so we can be a part of the buzz," she said. And she'll always be a New York Giants fan. "My dad and I used to sit around on the couch on Sundays and watch the Giants," she said. "I still have my Giants jersey from years and years ago." Her favorite author is best-selling fiction writer James Patterson, and she has more time to read now that she finds herself taking public transportation. "I can't get away from the crime novels," she said. It was a surprise to just about everyone when Jackson called DeKalb District Attorney Keyes Fleming and asked her to lead EPA's Region 4 office. Even Keyes Fleming -- who said she didn't know Jackson and had no background in environmental issues -- was surprised by the call. "I don't know how she found me, but I recall very vividly the day I got the call," she said. What Keyes Fleming did have was plenty of political connections. She had waged successful political campaigns for two offices -- as district attorney and solicitor general -- in a big urban county. She was an Obama supporter and a delegate to the Democratic National Convention in 2008. 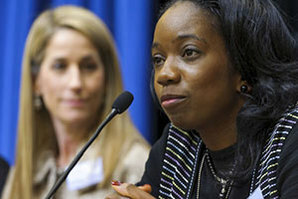 And her former spokeswoman, Adora Andy (now Adora Andy Jenkins), was Jackson's spokeswoman at EPA headquarters in 2010. So Keyes Fleming jumped at the opportunity. Then she got a crash course over breakfast on how to lead an EPA regional office. She didn't know anyone at the office when she started. "Not a soul," she said. But EPA's acting regional chief, Stanley Meiburg, took her out for breakfast once her appointment was public. She also had lunch with the agency's leadership team, who helped fill her in. Despite her newcomer status, Keyes Fleming quickly won the loyalty of many EPA staffers. When she came in, Meiburg was often asked about her lack of an environmental background. His response: not a problem. "We have hundreds of staff here who are environmental experts," he said. "What we need is good leadership, and that's really what she provided." She also brought her sense of style to the post. "I gained a lot of insight into matters relating to fashion," Meiburg joked of her tenure at Region 4. "She herself has a very strong sense of personal style, which I do not." Meiburg returned to be acting chief after Keyes Fleming left for Washington. Atlanta was the last of EPA's 10 regional offices to get an administrator under the Obama administration, with Keyes Fleming's appointment coming five months after the other nine slots were filled. Rumors on the cause for the delay ranged from speculation that candidates were unwilling to take on such a challenging region to the unexpected diversion of the Gulf Coast oil spill in 2010 (Greenwire, Sept. 7, 2010). "The time it took for the president to select a [regional administrator] for Region 4, I know, became a significant frustration to the region," said James Palmer, head of the regional office during the George W. Bush administration and now an attorney in Oxford, Miss. Palmer said Keyes Fleming acknowledged to the staff going in that "she had no background on environmental law," which was "a tribute to her straightforwardness and honesty." And over the years, "I generally got reports from senior managers over there that Gwen is and has been a quick study," he said. She became the first African American to hold the Region 4 administrator post -- a likely plus for the Obama administration, which has prioritized diversity in top federal jobs. "I don't doubt that diversity is always an important element in the White House's consideration of filling jobs, but I don't doubt for a second that it was just Gwen's overwhelming capacity to do this job that had to have been, I expect, the single most important consideration in her getting the nod ultimately," Robertson said. While at Region 4, Keyes Fleming counts among her biggest achievements reaching a deal with Florida to clean up the Everglades and another agreement with the Sunshine State to curb nutrient pollution in the state's waters. Not everyone was thrilled with her tenure, including some local environmentalists who wanted her to push harder on local wastewater issues. "I've been working on environmental issues for a long time, and you pretty much have to have a passion for it that's kind of based in being involved," said Jacqueline Echols of the South River Watershed Alliance, who has been working on water issues in Atlanta for about 16 years. Keyes Fleming "didn't come out of that environment. Once with EPA, I didn't see anything that would cause me to change my mind." Meiburg said it's impossible to hold that job without prompting some criticism, adding that she was very active on environmental justice issues and was effective at building relationships with state environmental commissioners. People who know Keyes Fleming use three words to describe her: tough, smart and ambitious. It's hard to be a prosecutor without having a tough exterior. She handled a spate of murder cases, including those of murdered children, which she called "very upsetting." But she learned how to keep a game face in the courtroom. "You build coping mechanisms, so you begin to look at the facts very analytically" and "put the emotion off to the side, so you can get the facts," she said. "You learn very quickly that if you bring emotion in too early, then you're not going to be effective. You get too tied into the case, you miss cues, you won't be able to see the own weaknesses in your case," she said. Then, when the tough cases end, "you go have a beer," she said. Or in her case, a glass of white zinfandel. Stephanie Stuckey Benfield faced off against Keyes Fleming years ago, when they were both starting out in their legal professions. "She's an excellent adversary," said Stuckey Benfield, executive director of the Atlanta-based environmental firm, GreenLaw, and a former member of the Georgia House of Representatives. A former public defender, Stuckey Benfield represented a client who was accused of killing his mistress, while Keyes Fleming led the prosecution as the assistant district attorney. The prosecution got a guilty verdict, she said, but the defense chalked it up as a partial win because they got a reduced sentence. Since those early days as a prosecutor, Keyes Fleming has been on a steady political climb. She was the first African American and the first woman to be elected DeKalb County's district attorney in 2004, an office that prosecutes about 6,000 felony cases per year. She was unopposed when she ran again in 2008. Prior to that, she was the first African American, first female and youngest person ever to be elected solicitor general in DeKalb County in 1998. She ran unopposed in 2002. That's after she spent stints as assistant district attorney in Fulton County and at the DeKalb County solicitor general's office. People who know Keyes Fleming won't be surprised if she's got more elections in her future. "This is not someone who fails," Stuckey Benfield said. "I fully expect her to come back to Georgia, and I want to see her run for office."